Last Monday, Bob and I were returning from San Diego, via Hwy 52. 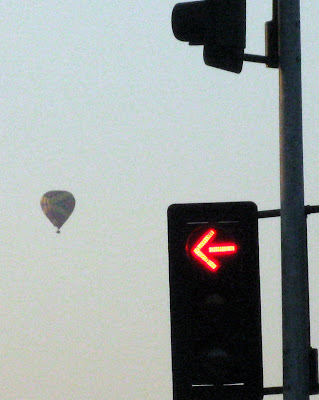 As we left the highway to grab a bite for dinner, at Bread Bites, I spotted this hot air balloon. This photo makes it seem as if the left hand turn arrow is pointing at the balloon. This was taken at dusk, so the sky isn't great looking. Now that is funny....amazing you eye caught that. Love the capture, great eye! You're right the arrow does seem to be saying "Look there!" Nice catch!